Covered outlets provide added protection from the environment and rugged working conditions. Rated 5 out of 5 by Provider19 from Great features and reliability This generator was purchased for power back-up for a community well providing water to 11 residential homes in a remote area. This generator provides reliable service and dependability during times of harsh weather conditions. It's easy mobility and minimal maintenance provides quick and dependable water service to our homes and residents during periods of local power outage. Rated 5 out of 5 by Pat from My XG10000E has had a long term test, it passed I live in the Upcountry of South Carolina, where we just had a pretty severe ice/sleet/snow storm. We received about three inches here at the house. Our power went off just after midnight, 28 hours ago, so I immediately started the generator and it, as usual, fired right up. I'd like to know that the power company will have us back on the grid today, but with 70,000+ without power, we don't know yet. I refilled the 10 gallon tank a second time tonight, first five gallons at about 6PM, second five gallons just after 3AM. I'll venture out to refill those gas cans later today. I had the whole set up done professionally be a local company that specializes in Generac whole house units, which was really worth the expense. That ran about $1400.00 including parts and labor, so the total came to around $3500.00, still well worth the peace of mind, and that my wife can have a hot shower when she wants it. Rated 5 out of 5 by DannyA from Extremely Reliable After Hurricane Irma caught me off guard in 2017, I swore it would never happen again. I bought the 10000E. I set it up per instructions. Fired it up. Put it up in November last year. Haven't touched it until last Wednesday the evening that Hurricane Michael hit SW GA. Our power went out at 5 pm on the 10th. I turned it on. Powered my well, hot water heater and all my house. It is still running right now on the 17th. It has well over 100 hours on it and has worked flawlessly. Thank you Generac for a great American made product. I highly recommend your products. Rated 1 out of 5 by NC10K from Not as good as my old Generac My old Generac lasted for almost 2 decades and was easy to service. I just received this one today, put the wheels on, added oil, etc. First problem, there was no nut/bolt to connect the negative wires to the battery terminal. Either it wasn't included or it came off in transport--my guess is it wasn't included. I used a temporary solution to connect it and crank it. It cranked easily, but second problem, it didn't have any electrical output. I turned it off and when it was turning off, the lights flashed. I turned it back on again, and then the lights came on. I'm concerned there may be an electrical problem, but I haven't used it enough yet to know for sure. Third issue I have is that the design is terrible for servicing the unit. The oil goes into a spot that is difficult to reach and the air filter is almost impossible to reach. My old unit was much easier to service. So far, I'm disappointed in the unit. Rated 1 out of 5 by Steve75 from Really let down I purchased this very expensive generator based on the well known brand name and the fact that it is American made. I used the generator 1 time...... yes 1 time. It started and I then stored it based on all the manufactures directives. I took it out and charged the battery and it wouldn’t start. It wouldn’t even turn over. A mechanic friend told me it was the starter that’s bad. I could not believe it on a machine that reads 0.0 on the usuage meter. I now have to submit it to a local shop that has a 3 week wait to even look at it let alone fixing it. I think the biggest let down it the fact that I spent so much expecting to get peace of mind and now I am and probably will be concerned on my family’s well being if we need this equipment. Rated 5 out of 5 by Patrick from This portable is exactly what I needed for Home backup I live out in a forest, with several fairly short power outages each winter, and sometimes in the summer. I needed an easy to operate portable generator around 10kw for powering up my home, including freezers and our well pump at 220 volts. This unit is compact, reliable, with a number of helpful features that make it easy for me and my family to operate. 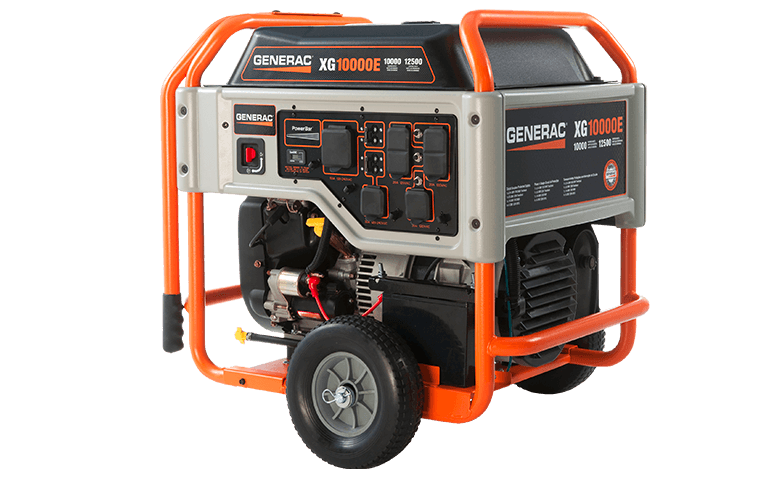 I was impressed with the reviews for this Generac generator and am happy with the purchase. Time will tell if it lasts the test of time. Rated 5 out of 5 by Jim from Excellent piece of equipment After being let down by our Coleman during Hurricane Irma, we decided to go with Generac. We are beyond satisfied with this generator. Very solidly built and easy to use. Rated 5 out of 5 by Andy64 from Just what I needed Just received my new generator about two weeks ago. perfect timing, I just completed wiring of my transfer switch. I tested last Saturday the 7th. wow I was able to power my 5 ton A/C unit, hot water heater all my lights, fans, computer, and TV. with just over 5000 watts, with plenty of power to spare. Very Happy with the performance. The only drawback which isn't really a game changer is the placement of the oil inlet tube, a little difficult to fill, over came problem by cutting a clear plastic tube and using it as a fill tube. 2nd, Draining the excess fuel from the tank is not that easy, but overcame the issue. If you want a portable generator with enough power to get you through a power outage in comfort, this is the unit for you. XG10000E is rated 4.5 out of 5 by 68.